Beige walls, an assortment of bottles and pills in jars, posters on the wall that show joints and organs. 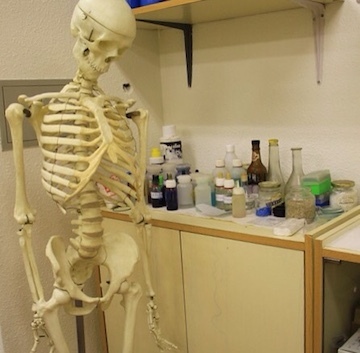 And a skeleton – the treatment room looks the business. This morning, he’s had a matte metal sign put up downstairs. Understated and elegant, it will speak to those with money to burn. It matches the look and feel of his website, as well. All that’s left is to stock the shelves with the little brown vials that contain his miracle cures for ailments from the common cold to cancer. People will believe anything if it’s presented it with confidence, don’t they? How true that is! It’s all about the marketing. Great idea, Sonya. Yes. It’s all about perception. 😀 Brilliant write, Sonya! Brilliant the story, and very true. It is all about the presentation. Wonderful story Sonya! I love the last line, “People will believe anything if it is presented with confidence, don’t they?” Hahaha! That is so true! Marketing..marketing..marketing! Yes. I agree. We tend to believe whatever is presented with confidence. Good one, Sonya. Yes. Yes they will. Take a look at all the junk science floating around the internet and you’ll see multitudes eating it up like it’s candy. P.T. Barnum understood so very well. Well written and clever story, Sonya. Great take on the prompt. The picture does have that medical office feel to it. Sneaky guy, but in a way he is right.when you are looking for a cure you hold onto what’s presented to you. V smart idea for a blog a hundred words per story. And your spot on, if the packaging is right people will buy it. I like your description-very sparse and clinical. Great story. You really established the setting very well and gave a feel for the corrupt character. That last sentence….What a truth!